For other uses, see Grand Theft Auto (disambiguation). 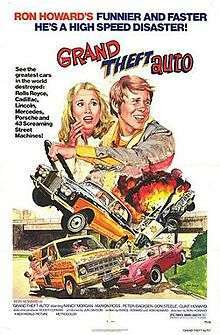 Grand Theft Auto is a 1977 American comedy road movie directed by Ron Howard. It was Howard's feature film directorial debut, and it features Howard as Sam Freeman and Nancy Morgan as Paula Powers in the leading roles. The film takes its title from the crime grand theft auto, which is committed a number of times by several different characters. Two young lovers, Sam Freeman (Ron Howard) and Paula Powers (Nancy Morgan), want to get married in Las Vegas. When Paula introduces Sam to her parents they dispute their daughter's decision: they see Collins Hedgeworth (Paul Linke), the son of a wealthy family in the area, as her fiancée. Paula's parents are rich as well and her father, Bigby Powers (Barry Cahill), is planning to run for governor. They think Sam is marrying Paula for the money and call him a fortune hunter, which Paula fiercely disputes. Sam is thrown off the premises and Paula is sent to her room. She escapes through the window, steals her parents' Rolls-Royce, picks up Sam and hits the road: this is the beginning of two runaway lovers in a wild explosive car chase and race towards Las Vegas. As news of their elopement spreads, several people start off after them to try to stop the fleeing couple. Paula's father, Bigby Powers starts the chase by arranging his helicopter. Collins Hedgeworth leaves his stable and starts chasing his love interest like mad. When he calls to the TenQ radio station – to DJ Curly Q. Brown (Don Steele) – he offers a USD$25,000 reward for the ones who can catch Paula and Sam. As a result the chase becomes more and more chaotic as many people along and on the road try to stop the couple in order to claim the reward. A number of cars are wrecked and stolen, and a subsequent reward of $25,000 is offered for Collins Hedgeworth, who is wanted by the police for grand theft auto, after he stole a car. With so many cars following them, Paula and Sam turn onto small, country roads to try to lose their pursuers. He wants to head somewhere else to get married, but she is set on a Vegas wedding. Paula's father makes an emotional appeal to her via telephone, but she refuses to listen to him. As they approach Las Vegas, Sam begins to have doubts about Paula's reasons for eloping, and questions whether she is genuinely motivated by affection for him or a desire to spite her father. She persuades him that she does want to marry him. The chase is gaining increasing coverage in the news media, with live cameras following the chase. The pursuing cars become involved in a demolition derby, leading to a massive pile-up. The priceless Rolls Royce is totally destroyed, but Paula and Sam manage to escape. They eventually get married. When Roger Corman was testing titles for Eat My Dust, Grand Theft Auto came a close second as a possible title. So when making a follow up he decided to call it Grand Theft Auto. The film was made on a budget of $602,000. It was filmed in and around Victorville, California. Roger Corman worked as an executive producer, along with Rance Howard, who also co-wrote the script with Ron. The film was a commercial success, earning over $15 million at the box office, but critical reception was more mixed. The film was released on Region One DVD in 1999 and re-released in 2006 and 2008. ↑ "Grand Theft Auto (1977)". Box Office Mojo. 1977-06-16. Retrieved 2013-09-22. ↑ "Grand Theft Auto: Tricked-Out Edition (1977)". Dvdmg.com. Retrieved 2013-09-22. ↑ "Grand Theft Auto - Rotten Tomatoes". Uk.rottentomatoes.com. 2010-09-09. Retrieved 2013-09-22. ↑ "All About Grand Theft Auto, The Movie". deadline.com. Retrieved 2015-06-27. This article is issued from Wikipedia - version of the 6/15/2016. The text is available under the Creative Commons Attribution/Share Alike but additional terms may apply for the media files.